Time to plan a family vacation with a real wow factor. Rent a houseboat, go white water rafting, sleep in a treehouse. The sky's the limit. You can't change lanes quickly in an RV: Designate a navigator with binoculars in the passenger seat to help you anticipate exits and turns. Aim to reach campsites well before dark. 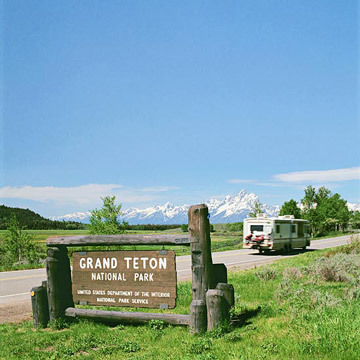 Rates start at $4,210 for a family of 4, including RV rental, campground reservations, itinerary, hotel stay, guided tour of Yellowstone with lunch and admission to Grizzly Discovery Center. Call 800-247-0970; tracks-trails.com. Jackson Hole is a classic frontier town. Catch mock shoot-outs in the square, and watch cowboys at Jackson Hole Rodeo (adults, $15; kids 4-12, $9; jacksonholerodeo.us). Rocky Mountain National Park, Colorado: American Wanderer customizes guided family trips from Denver, May to June and mid-August to mid-October. Four-night trips start at $1,100 for a family of 4, including RV and all meals; rvcampforkids.com. Outer Banks, North Carolina: Sleep at Cape Hatteras KOA campground; sites range from $70 to $90 per night; koa.com/campgrounds. Santa Barbara, California: Park at Ocean Mesa Campground, overlooking the Pacific; RV sites are $70 to $90 per night; oceanmesa.com. Houseboats are especially fun to share with friends or extended family (picture an RV on water!). They can accommodate up to 12, with kitchen, family room, multiple bedrooms, waterslide, and deck mats for sleeping under the stars. Rent one on Lake Powell, which flows past the red rock towers of Glen Canyon National Recreation Area, only accessible by water. Drop anchor on a secluded beach, your home base for exploring. Hike over rocks where dinosaurs and Navajos once walked. Kayak to hidden coves and watch the sunset turn the rocks different colors. Then light a campfire and enjoy the meteorite show. Your houseboat awaits at Wahweap Marina near Page, Arizona, after a 3-hour instructional orientation. Buy groceries and firewood beforehand, and bring fishing poles if you'll be catching your dinner. Three-day rentals on the 46-foot Voyager Xl range from $1,686 in budget season (mid-October through mid-May) to $2,248 in summer. Kayaks, $46 per day; jet skis, $335 per day. Call 888-896-3829; lakepowell.com. The area around Page is rich in Navajo culture. Follow a guide through Antelope Canyon, with its spiral-carved rock formations and cathedral-like atmosphere (adults, $20; kids 6-12, $15; navajotours.com). Learn traditional dances at Navajo Village Heritage Center (adults, $30; kids 11-17, $20; navajovillage.com). Then head to a National Park: Zion, Bryce, and the Grand Canyon are less than 3 hours away (nps.gov). Lake Cumberland, Kentucky: Three-day rentals on a 60-foot houseboat start at $795; houseboating.org. Suwannee River, Florida: Miller's Marina offers 2-day trips on a 44-foot vessel, starting at $599; $1,495 for a week; suwanneehouseboats.com. Lake of the Ozarks, Missouri: Three-day rentals on a 56-foot houseboat start at $1,875; lakeoftheozarksmarina.com. 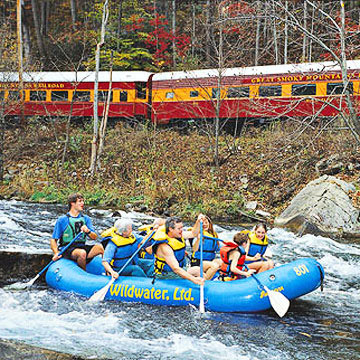 The Nantahala River has phenomenal white-water rafting—see it two ways on the Wildwater Raft & Rail adventure. First, board the vintage Great Smoky Mountains Railroad train in the morning, for a 2-hour tour that takes you across the 100-foot-high Fontana Trestle and alongside the river as paddlers zoom by. A bus meets your train and transports you to the river entrance, where guides give you gear and lessons, then lead you on a 3-hour thrill ride. When you finish, dry clothes, hot showers and a hearty meal await. Wear bathing suits under quick-dry shorts (rental wet suits are also available). Take towels, snacks and a change of clothes, and eat a good breakfast—lunch isn't until after the rapids ride. Adults, $99; kids under 12, $82. Stay over at Falling Waters Resort, from $84 per night for up to four people (fallingwatersresort.com). Call 866-319-8870 or go to wildwaterrafting.com. Hike, bike or horseback-ride through Great Smoky Mountains National Park, where trails overlook stunning waterfalls and vistas. Settle into a 2-bedroom cabin at Nantahala Village, starting at $160 per night from mid-June to mid-August (nvnc.com) or camp out (see greatsmokies.com for sites). For Native American culture and crafts, check out Oconaluftee Indian Village (adults, $20; kids 6-12, $12; cherokee-nc.com). Need some theme park action? Dollywood in Pigeon Forge, Tennessee, is only 90 minutes away. American River, California: ARTA's 2-day guided camping trips are best for beginner- and intermediate-level paddlers. Starting at $232 for adults and $170 for kids 17 and under, arta.org. New River Gorge, West Virginia: Guided 2-day rafting/camping trips from Class VI Mountain River on the gorge start at around $315 per adult (including meals); kids 12-16 (must be at least 12 years old to participate), $285; class-vi.com. Salmon River, Idaho: Row Adventures' 4-day family trips through Salmon River Canyons feature beach camping, and stop at pioneer homesteads and Native American sites; starting at $1,245 per adult; $1,055 for kids under 16; rowadventures.com. 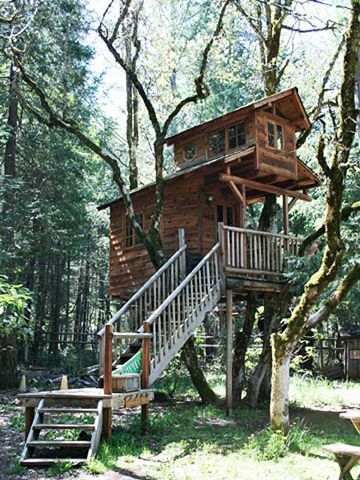 Turn over a new leaf by staying in Out'n'About Treesort's unique treehouses. Most sleep 4 or more; all have fridges; some have sinks and toilets (there's a ground-level bathhouse too). Spend your day hiking, swimming in the freshwater pool, or playing volleyball or basketball. Try the zipline course, trail rides and guided rafting, for an extra fee. Breakfast is served daily; you're on your own for lunch and dinner—grills and stoves are available, and restaurants are 15 minutes away. Plan to visit from mid-June through mid- September, for the best chance at mild, dry weather. Pack a flashlight, bug repellent and a first-aid kit, plus beach towels for the pool. Treehouses start at $120 per night; including breakfast. Zipline is $45 per person; horseback-riding, $35 per person; rafting, $60 per person. Call 541-592-2208 or go to treehouses.com. Oregon Caves National Monument is just 30 minutes away (adults, $8.50; kids under 16, $6; nps.gov). Kids over 15 can crawl through the off-trail caving tour wearing lighted helmets ($30). Also hike Oregon's spectacular coastal trails or through California's Redwood National Park, both less than 90 minutes away. Live Oak, Florida: The treehouse at Spirit of Suwannee Music Park, on Florida's Panhandle, sleeps 4 and overlooks the bluegrass concert stage. $165 per night with 2-night minimum; musicliveshere.com. Hot Springs, North Carolina: Hot Springs Treehouse Cabins in the Blue Ridge Mountains near Asheville have satellite TV, DVD players and handmade willow and log furniture. Starting at $125 per night, $750 per week; hotspringstreehousecabins.com. Snowden, Washington: Lothlorien Woods Hide-a-Way sleeps 4 (kids under 12 need prior approval) and is close to the Columbia River Gorge. Starting at $135 per night; lothlorienwoods.com. 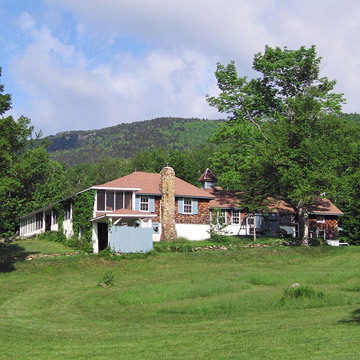 Tucked in Western Maine's White Mountain National Forest, Telemark Inn is a wilderness lodge ideal for animal-loving families. Half-day guided llama trips are its specialty—load llamas with gear, then hike beside them past waterfalls and beaver dams to a secret swimming hole. You can also interact with horses, sled dogs, and hummingbirds, set up bird feeding stations, tend organic gardens and learn about the resort's alternative energy sources. This vacation is best for outdoorsy, crunchy-granola types who don't mind a slow pace. Accommodations are rustic but comfortable; healthy, home-cooked meals make the most of fruits and veggies from lodge gardens. Two-day packages, $395 per adult, $290 per child under 14; 3-day packages $575 per adult, $425 per child. Rates include lodging, meals, horseback riding, and nightly campfire. Call 207-836-2703; telemarkinn.com or newenglandridinganddriving.com. Just an hour away in Bretton Woods, New Hampshire, the Cog Railway climbs to Mt. Washington's summit, elevation 6,200 feet (adults, $62; kids under 13, $39; thecog.com). Neighboring North Conway has kayaking, water parks, and the ultra-cool Monkey Trunks high-wire adventure course (adults, $49, kids under 17, $39; monkeytrunks.com). To explore the Maine coast, drive 3 hours east to charming Camden and Rockport, or continue to Acadia National Park, 5 hours from Bethel. Smokey Mountains, North Carolina: English Mountain Llama arranges day-long treks for $100 per person, and 2- to 3-day camp-outs starting at $280 for adults; $270 for kids 12 and under; hikinginthesmokies.com. Cascades and Olympic National Park, Washington: Deli Llama offers 4- to 7-day treks (May through September), starting at $170 per person per day (6-person minimum); delillama.com . Strawberry, Arizona: The Ranch at Fossil Creek (between Phoenix and Flagstaff) sets up half-day llama hikes with lunch; adults, $65; kids under 12, $40; optional overnight in yurt, $85; ranchatfossilcreek.com. 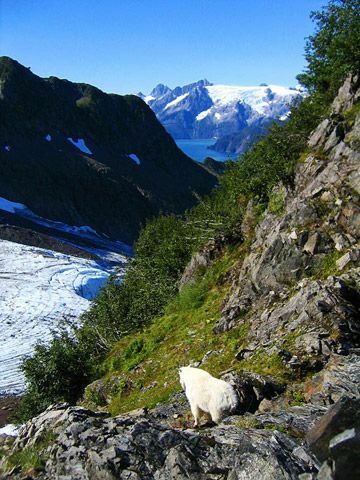 Lead huskies through summer snow in remote areas of Kenai Fjords National Park on the Godwin Glacier Dog Sled Tour. Your adventure begins with a helicopter ride over ice-capped mountains and glittering Resurrection Bay, where orcas and eagles chill out. When the chopper lands on Godwin Glacier, your dog team awaits. Guides share dogsledding wisdom; then as quick as you can say "mush," you're gliding across the tundra—and everyone gets to drive! Feeling extra-adventuresome? Opt to camp overnight on the glacier in heated shelters (guides stay too), with dinner and breakfast delivered. Waterproof boots, pants and jackets are provided, but bring gloves, hats, and sunglasses—the snow can be blindingly bright. Ski goggles are a good idea too—dogs kick up lots of slush. Without overnight stay, adults, $450; children 12 and under, $420; with overnight stay, adults and children, $520. Stay awhile in Seward, gateway to the scenic Kenai Peninsula. Rooms at Harborview Inn start at around $149 per night in summer (sewardhotel.com); Holiday Inn Express has rooms (and a pool! ), starting at around $198 per night (hiexpress.com). Learn about native marine animals at Seward's Alaska Sea Life Center (adults, $20; kids 12-17, $15; kids 4-11, $10; (alaskasealife.org). Catch a boat to Chiswell Islands, refuge to puffins, seals, otters and whales (alaskamaritime.fws.gov). And return to Kenai Fjords Park, for free ranger-led hikes to awesome Exit Glacier, and challenging day-long treks along the Harding Icefield Trail (nps.gov/kefj). Don't even think of napping on the 2-1/2-hour drive to and from Anchorage Airport—the scenery and wildlife sightings are spectacular! Jackson Hole, Wyoming: Glide through Yellowstone, and the Teton and Shoshoni National Forests, November through April, with Continental Divide Dogsled Adventures. Rates range from $180 per person for half-day tours to $270 per person for full day with lunch; dogsledadventures.com. Ely, Minnesota: Wintergreen Dogsled Lodge features 3-night vacations from December through March, where you dogsled by day and sleep in the lodge at night; starting at $675 per adult; first child under 17, $575; second child under 17, $475; third child under 17, $375; dogsledding.com.